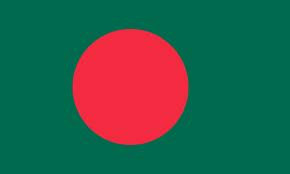 Bangladesh is a tropical country located between longitudes 88 degree and 93 degree east, and latitudes 20 degree to 27 degree in the northern hemisphere. Its territory is located on the flood plains of the river Ganga, Bhramaputra and Meghna. It is bounded by India from the west, north and east and by Myanmar to the southeast. Physically this country is a vast alluvial plain sloping southward, from the Himalayas to the Bay of Bengal. To the east of this plain lies the Lushai hills and to the west lies the Chotonagpur highlands of the Indian plateau. 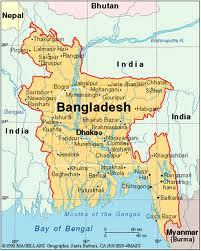 The total surface area of this country is around 150000 square kilometer.